Everybody dreams to be an Internet millionaire, me too. Before you become an Internet millionaire, why not stop by, read someones story and get inspired by them? 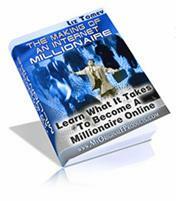 This is a FREE ebook, telling some truth on process of becoming Internet millionaire. In reality, not many people will success and become Internet Millionaire, probably 98% are doing average, and only 1-2% are doing extremely good. Real success does not come from sitting facing computer alone, but it involved putting in a lot of hard effort, and hours and hours of research. We are providing FREE download link here, you can download as many copies as you want, if you like our site, please link to us for download. We will provide many more free ebooks in the future for download. 'Like' us if you like our ebooks.